Ever felt like stress is gnawing into your happiness? Want to declutter your mind to reduce the stressful feelings? With 48% people around the world saying stress has had a negative impact in their lives and has increased over the last 5 years, stress is a bigger problem than we all imagined! How does stress affect you? All of us have different and varied types of stress. Stress at home, stress from our families, work-related stress, financial stress… The list goes on. And we are all affected by stress in different ways. Often, it’s our thoughts that increase the stress that comes with life situations. Negative self-talk can have a huge impact on our stress levels. Science says more than one minute of negative self-talk bombards your brain with the toxic chemicals including the stress hormone cortisol. So, with this in mind, the best way to manage, or even reduce your stress levels is to remove the negative self-talk and declutter your mind before you lose your mind. How do we go about doing this? 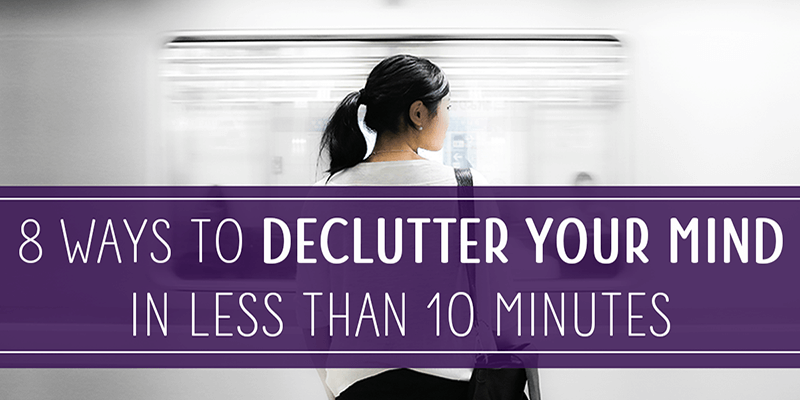 Fortunately, there are some simple yet highly effective techniques that you can do to declutter your mind in under ten minutes each to keep those stress levels under control. Ready for some spring cleaning for your head? Most of us live in a mental rat race of thoughts, ideas, reminders, memories and mental clutter that fills up our head. Add to this negative self-talk and there is no room to mentally breathe. Practicing mindfulness can help reduce the mental clutter or and the very least identify the bad thoughts from the good thoughts to eliminate negative thinking patterns. The biggest reason why Mindfulness is so effective is that it is the simplest most effective way to segregate and manage the clutter your head. It forces you to be in the now and focus your mental energy on one task at a time. Scientists have integrated mindfulness into cognitive behavioural therapies called Mindfulness Based Stress Reduction or MBSR. Using these mindfulness principles to help declutter your mind will go a long way to helping you reduce your stress levels. Focus on the task at hand and not try to do several things at once. Think about your words when you are talking and be mindful of the words you use… Try to use more positive words rather than negative one. When someone else is talking to you, give them your undivided attention. Focus not just what they are saying but their body language as well to get the full story of what they are saying. Focus fully on the task at hand to get the full benefits. For example, when you eat, chew the food by appreciating the variety of tastes and flavours in it. Also, listen to how your body is reacting to the food. One of the unique ways to see through your mental clutter and organize both your thoughts and your physical environments is to use mind mapping. Mind mapping requires the user to transfer the complete set of congested thoughts in the head, onto paper. It is a systematic way of working through all your thoughts, finding out which thoughts are important and which are simply taking up too much space in your head. Mind mapping is an excellent way to create an action plan for all areas of your life. 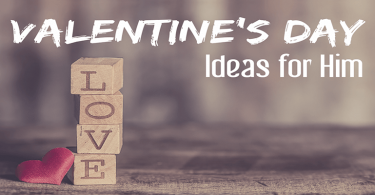 Once you have all your thoughts out of your head and down on paper you can use these thoughts to generate tasks lists, action plans and greater ideas without worrying that you are adding further to the mental clutter. Branch the map out as much as you can to get the full effects of mind mapping and to pull-out every thought in your head and have it down on paper. Completing this simple exercise does not take very long but once everything is written down you will find the stress of trying to remember everything reduces considerably… You don’t have to remember it, it’s all there written down. Take a sheet of paper or a white board. Divide it into the aspects of your life such as ‘Work’, ‘Family’, ‘Friends’, ‘Social life’ or ‘Playing’. Write everything that comes to your mind when you think about each aspect, one after another. According to scientists, all of us think up to 300 thoughts every minute. Referred to as self-talk or private speech, our own attitude towards life determines if the self-talk is productive or toxic. Imagine a friend telling you 300 new things every minute. If it is all negative, would you keep that friend for long? Often, most of us lose hope in life and see our stress levels rise unnecessarily not because of life events, surprises or random people, but because of our own pessimistic attitude towards life. Positive affirmations can help you break the habit of negative self-talk as well as help you declutter your mind of unwanted or harmful thoughts altogether. After all, as Buddha teaches us… “The mind is everything. What you think, you become”. Creating and reading out positive affirmations is a great way to retrain your brain to think positive instead of negative. Continue the practice of repeating positive affirmations out loud to yourself every day and your mind will be decluttered in no time! Create a list of negative thoughts that you usually have running through your mind. Now, write up to 5 positive affirmations for every negative thought on your list. Working to a Pomodoro Timer is another great way to declutter your mind and reduce stress. Not sure what a Pomodoro Timer is? It’s a time management technique that breaks down your work into short, usually 20 – 25 minute, intervals with a break in between each interval. The intervals are called pomodoros with means tomato and was named by Francesco Cirillo who got the name from his tomato-shaped kitchen timer. Practicing the Pomodoro Timer technique every day and you will quickly find it an effective way to declutter your mind! Choose one task to work on. Set a timer for 10 – 20 minute interval. When the interval finishes, make a note to indicate one interval and take a 3-5 minute break. After five minutes, restart your Pomodoro timer and again focus on the task at hand. When you have completed 4 intervals (or pomodoros) take a longer 30-minute break. Most of us have gone on vacation to release our physical stress and give our bodies a rest, but not many of us take time out specifically to give our brains a rest to reduce our mental stress. The great thing with mental vacations is you don’t need expensive air tickets or hotel reservations, all you need is a quiet, comfortable space where you can sit without any disturbances. In fact, sometimes, all you need to do is close your eyes and simply daydream. Another great thing about mental vacations is they don’t take much planning and they can be as long and as short as you need them to be. Mental vacations can free you from the clutches of stress, anxiety and even depression! Whenever you feel stressed, close your eyes. Take a deep breath and exhale softly. Continue to breathe deeply and evenly. Try to focus only on your breathing and nothing else. Open your eyes only when you feel calm. Meditation can mean different things to different people. Some see it as the act of contemplation or reflection while other will practice meditation to clear their mind completely. Essentially it’s the art of removing the background noise from both our physical world and our mind to focus and gain greater insight or clarity in our lives. Training your mind to clear of all mental clutter, distraction or unnecessary ‘noise’ or mental chatter can help enormously to reduce stress, handle tough situations better and make better choices in our lives. Essentially, it is the ability to shed the physical discomforts to focus on whatever you desire, mentally. Continue the breathing exercise outlined in the step above by taking deep inhalations and exhalations. Focus only on the breath entering your respiratory tract and moving through every part of the body. After a while of focusing on your breathing, you will find you are feeling calmer and the material worries that led you to meditate will not seem so overwhelming. Just like every house has cornerstones that keeps it erect and prevents it from falling down, keystone habits are fundamental habits that make up our lifestyle and ultimately leads us to achieving big goals… or not. Keystone habits keep us motivated and focused to bring about big changes in life. Just like Charles Duhigg, author of The Power of Habit explains in his book, Keystone habits change more than just our behavior – they change how we see ourselves. In order to declutter your mind and reduce your stress, building positive keystone habits into your lifestyle can make a significant impact and help you achieve all your goals and dreams. Decide on a big goal. Commit to making a new habit that will get you to that goal. For example, start reading ’50 pages per day’ if your goal is to read 30 books this year. No matter what happens, stick to your keystone habit. Our brain is not a concrete set of bones. It is a set of neural pathways capable of changing itself due to the plastic-like ability, called the neuroplasticity of the brain. Simply put, your brain chemistry can change based on the thoughts you feed it. To get rid of the cluttered and toxic thoughts in your brain, you need to understand those thoughts. Journaling is a great way to do this. Journaling is the art of expressing your thoughts via writing. Journaling can be particularly effective if practiced alongside mindfulness and meditation to declutter your mind. Take a new diary, notebook or journal and your favourite pen. Whenever stress is building up, open the journal and start writing down your thoughts. Expressive writing in a journal can also be revised into action plans or tasks like on a mind map. Any and all of these 8 stress relieving techniques can be carried out in 10 minutes or less and can be done just about anywhere. Of course the more you practice these techniques the better off you stress levels will be. 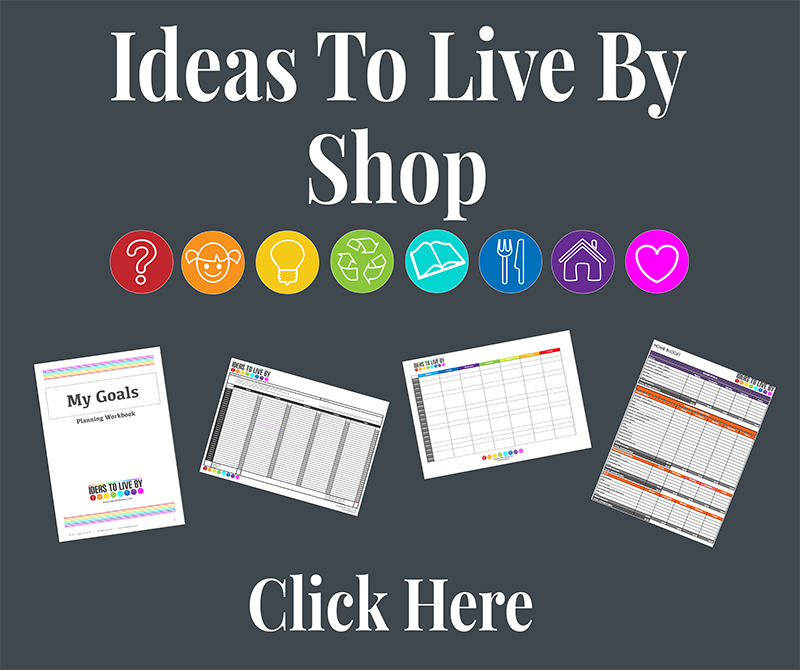 Don’t forget to check out our shop for time tracking and goal setting tools to help you declutter your mind and reduce your stress. Most of us clean our homes before the New Year, to welcome the new year with 100% freshness. This New Year, along with your physical clutter make a resolution to get rid of the mental clutter called stress! As a bonus way to declutter your mind, embrace the art of opening up. Sharing your worries and stresses with your partner, parents, friends or family is a good idea to help you get perspective and advice. 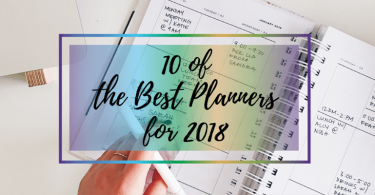 Okay… we’ve shown you the way, all you need to do is pick one or more of the simple de-cluttering techniques from the list above and apply it RIGHT AWAY!